Despite being the second-most prescribed drug, to more than 30 million Americans, antidepressants don’t work for nearly a third of those who try them. Annually, more than 40,000 Americans commit suicide, about half of whom suffered from major depression — and those numbers are rising at an alarming rate. Suicide is now at the highest level in three decades, with increases in nearly every age category. 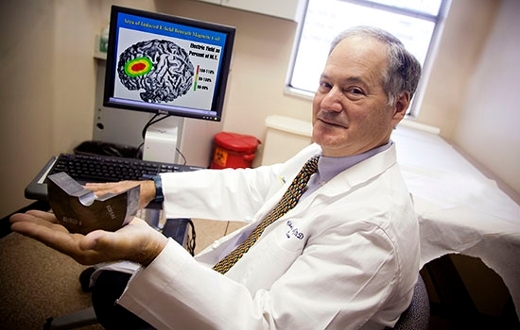 Emory neurologist Charles Epstein helped refine a novel therapy — transcranial magnetic stimulation (TMS) — to become an FDA-approved treatment for depression. What motivated you to work on a treatment for depression? We had developed an improved transcranial magnetic stimulation (TMS) coil for another purpose, and learned that teams at the Medical University of South Carolina and the National Institutes of Health were just working out a theory of how TMS might treat depression. Our new coil turned out to be ideal for that application. What are the advantages of TMS to other treatments? It is non-surgical and non-invasive, with very few side effects, and it’s been shown to work in patients who have not responded to other treatments. How exactly does TMS work? A magnetic pulse is delivered by a coil on the surface of the head, generating small bursts of MRI-strength magnetic energy that stimulate nerve cells in one specific area of the brain linked to mood, the left pre-frontal cortex. The stimulation seems to work by “turning on” parts of the brain that are underactive in depression. How long does it take and how many treatments to you need? Most people need daily treatments for a week to a month to get the full benefit. After that, some people need an occasional “boost” a few times a month. Neuronetics, the Emory partner and start-up company created for the development of NeuroStar TMS therapy, has safely administered more than 10,000 treatments with clinically significant results: among patients studied, 54 percent responded to the therapy and 33 percent found their depression in remission. What role did you play in the innovation? More than a quarter-century ago I built my first TMS system, discovered that it needed a lot of power and generated huge amounts of heat, and realized that a more efficient magnetic coil could make a difference. I was able to team up with Kent Davey, a friend and magnetics specialist at Georgia Tech. We had joint research support from Emory and Tech. How was your TMS system better? To give you a sense of the power requirement for TMS: A standard old-fashioned lightbulb uses 100 watts of electrical power, which gives a fair amount of light. TMS treatment comes in pulses, usually 10 pulses over and over. For other systems, a single pulse requires up to 5 million watts. That’s 50,000 standard light bulbs going off at once for about one ten-thousandth of a second. What we invented takes a quarter of the power and produces eight times less heat on a person’s head. We no longer needed to keep air and water running around the coil to cool it. Has TMS been accepted by the psychiatric community as an alternative treatment for depression? The mental health community is enthusiastic. Antidepressant medicine and talk therapies do not help everyone. Something else is needed. Electroshock therapy is a very effective treatment for depression but is plagued by complexity and side effects, with memory impairment being the most frequent. What is it like to meet a patient like Martha Rhodes, whose life has been changed by your technology? It’s fantastic! To have built something in the basement that is out there treating thousands of people, changing their lives and making them better, is amazing. ﻿Martha Rhodes - wife, mother, grandmother, former high powered advertising executive in New York City, and depression patient who became treatment resistant, attempted suicide, and eventually found TMS (transcranial magnetic stimulation) to treat and manage her depression. Martha is an advocate for TMS therapy, speaks regularly on the topic, and has written a book about her experience “3,000 Pulses Later.” On a recent visit to Emory, Rhodes got to thank Dr. Charles Epstein and speak about her book.